For his work using genetic technologies to improve marine conservation. Stephen Palumbi teaches and does research in evolution and marine biology at Stanford University, and has long been fascinated by how quickly the world around us changes. His work on the genetics of marine organisms tries to focus on basic evolutionary questions but also on practical solutions to questions about how to preserve and protect the diverse life in the sea. DNA data on the genetics of marine populations like corals helps in the design and implementation of marine protected areas for conservation and fisheries enhancement. A second focus is on the use of molecular genetic techniques for the elucidation of past population sizes and dynamics of baleen whales, with the notion of recreating a better sense of the ecology of the virgin ocean. Palumbi has lectured extensively on human-induced evolutionary change, has used genetic detective work to identify whales for sale in retail markets, and is working on new methods to help design marine parks for conservation. Dr. Palumbi Director of Hopkins Marine Station, Stanford University and is the Harold A. Miller Professor in Marine Sciences, Stanford University. He received his Ph.D. from University of Washington in marine ecology. His research group studies the genetics, evolution, conservation, population biology and systematics of a diverse array of marine organisms. 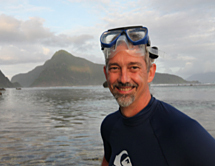 His research interests are similarly widespread, and he has published on the genetics and evolution of sea urchins, whales, cone snails, corals, sharks, spiders, shrimps, bryozoans, and butterfly fishes. A primary focus is the use of molecular genetic techniques in conservation, including the identification of whale and dolphin products available in commercial markets.